You might ask yourself, “How far would Stephen King’s fans go to read his latest book before the publication date?” Well, his UK publisher asked themselves the same thing. Then they broke down his latest tome into 5000 pieces and seeded it across various fansites, inviting readers to a game of literary hide and seek. Some people took it to extreme lengths, even hiding snippets of the manuscript by hanging it from bridges and scribbling it on public walls, to hiding it in code online. It is predicted that while Under the Dome is no Lost Symbol, it will certainly hit the bestseller lists, and fast! 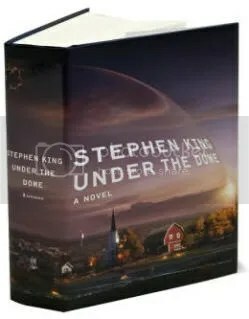 Have you read Under the Dome yet, or are you planning to purchase it soon? A note to the tech-savvy: the digital e-book retails at $35 and will be available on Dec 24th.